Eagle Superabrasives located in Hickory, NC, boast an extensive inventory of over 6,000 diamond, CDX and CBN grinding wheels. Ninety-percent of orders are on location and ready for same day shipping, We can even fill custom orders in as little as seven days. Don’t settle for subpar Superabrasives; contact the industry leading experts at Eagle Superabrasives for all your grinding needs. What are CBN Grinding Wheels? 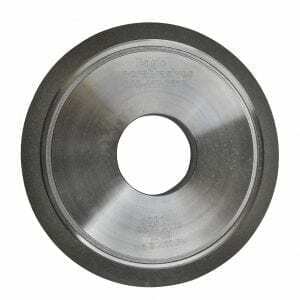 Diamond grinding wheels have always been thought to have superior performance over any grinding wheel in the industry. Diamond grinding wheels are great for carbide, glass and ceramics, but they don’t handle heat well when it comes to sharpening the hardened steels that are used in tools. CBN grinding wheels have taken over the industry. CBN is a man-made material that rivals the hardness and durability of diamond. CBN is named for its cubic form of boron nitride (cBN). The CBN crystals are joined together from equal parts of boron and nitrogen. We all know that working with difficult to grind (DTG) materials causes a rapid breakdown on most wheels due to the heat that is generated. CBN grinding wheels are the solution to such a problem. The cBN compounds can withstand temperatures of 1800 degrees Celsius. CBN grinding wheels can grind hard metals, cast irons and nickel-base Superalloys far faster and more precise than other abrasive. While diamond wheels may have a difficult time grinding steel at high temperatures, CBN grinding wheels are the preferred method when grinding DTG materials. Another advantage of using CBN grinding wheels over conventional abrasive wheels is that there isn’t a risk of wheels chipping or cracking from tool dig ins. Conventional grinding wheels can easily be damaged for example when tightening a flange nut too much, causing the wheel to break. With a CBN grinding wheel, you don’t have to worry about over tightening as the wheels centers are made for Aluminum, Steel, Copper or other very durable materials. CBN grinding wheels are such a superior abrasive product with many benefits, you may be starting to ask yourself “What are the factors that affect its lifespan?” We have found that the breakdown of the bond layer is the main cause for wear with all wheels. The bond is what keeps the abrasive materials (cBN) attached to the wheel matrix. Our expertise at Eagle Superabrasives has led us to develop an advanced bonding system that ensures our CBN grinding wheels last longer and cut cooler to boost your productivity and save you money and time. If you would like to read more about CBN Wheels click here. For high quality products delivered with superior customer service, contact the experts at Eagle Superabrasives. Whether you’re in the market for CBN grinding wheels or need advice along the way when shopping for a grinding wheel that fits your business needs, Eagle Superabrasives is the solution.